ACOPOWER 220WH Solar Generator is one of our most popular lithium energy storage products. It features small size, simple design as well as its pure sine wave which protects your devices at its most. 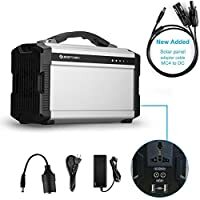 This portable solar generator has built-in solar charging controller and 200W Pure Sine Wave AC inverter.ACOPOWER 220Wh 110V/60HZ Portable Solar GeneratorCapacity: 220Wh(60000mAh /3.7V) High Quality LiPolymerBatteries AC Output Voltage: 110±3%Output Frequency: 60Hz±0.5HzOutput Power: 200W (Pure Sine Wave)Peak Output Power: 250WDC 2×USB Port: 2×5V3.1A2×DC Port: DC 9~12V/5A MaxPeration temperature: -20?-60?Super Portable LightweightWeight:5.5LBWidely Used For Indoor or Outdoor Such as Family, Office, Travel, Camping, ETC AC Output: three-prong AC output capable of delivering 200W of power and it does deliver pure sine wave thanks to the inverter inside the unit, which are preferred for many electronics and equals to the wave of grid-tie system. Note: For the safety purpose, AC output would stop working while the battery is being charged.Three Ways to Charge the battery1? 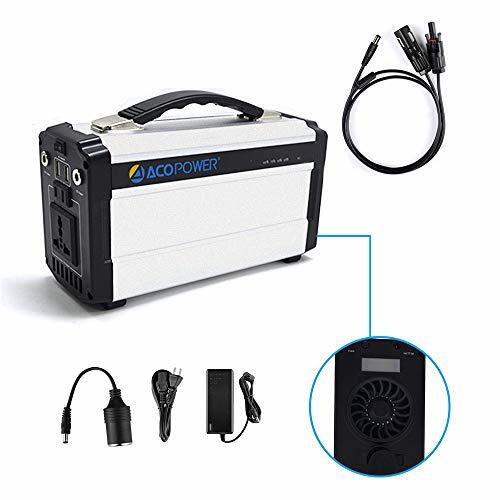 ACOPOWER 220Wh Can be Charged by Connecting a Compatible Solar Panel. You Can Use Standard Solar Panel ACOPOWER 20W~70W , ACOPOWER Foldable Solar Panel 2*30W and ACOPOWER Portable Solar Panel 50W ?70W ?Solar Charge Pack.Note: if you would use the solar panel to charge it, an adapter is included and you do not need extra charge controller. Please choose the solar panel 20W-70W. The higher voltage may block charging.2? ACOPOWER 220 Can be Charged by being Plugged Into a Regular AC Wall Outlet.3? ACOPOWER 220 Can be Charged by Plugging Into Your Car Adapter. How Long Can Charge Fully: From AC wall charger (70W), 7~8 Hrs. From Solar Charger (50W), 5~6Hrs From Solar Charger (70W), 4~5 Hrs. Charge Anywhere.
? Solid Solar Generator: a full charge of 4-5 hours with ACOPOWER 50w suitcase PV panel ASIN: B06WWQHV2T; other compliable ACOPower PV chargers are from 30w to 70w as options; another 2 ways charging by AC 110V wall outlet, or DC car charger. No more accessories are needed, start to use/recharge it in two seconds ? Portable & Safety: light weight of 6.7 lbs, mini size of 9.8*6.3*3.4in built in high energy density lithium ion battery, safer than normal Li-ion battery; stronger storage ability, 1.5 times of other lithium batteries. It has short-circuit protection as well as overcharging protection and discharging protection, and a cooling fan is built in to avoid over-heating ? 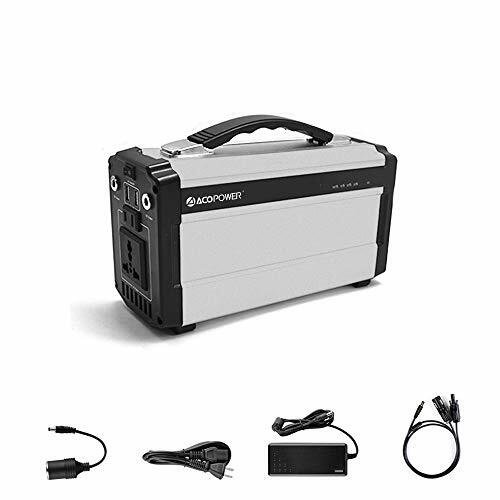 Versatile Output: charge regulator included, DC/AC inverter included, 2 USB ports for phones and ipads, 1 AC 110v inverters for home electronics charging with low losses, 2 DC Ports for lighting (Please note: stop charging when you are going to use the outputs.) ? 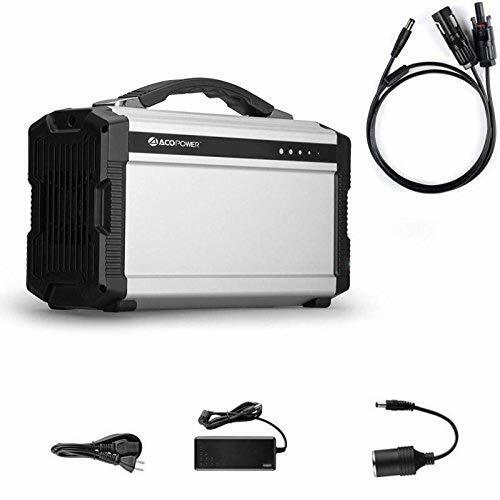 Outdoor or UPS: the portable solar generator was designed for camping and UPS. 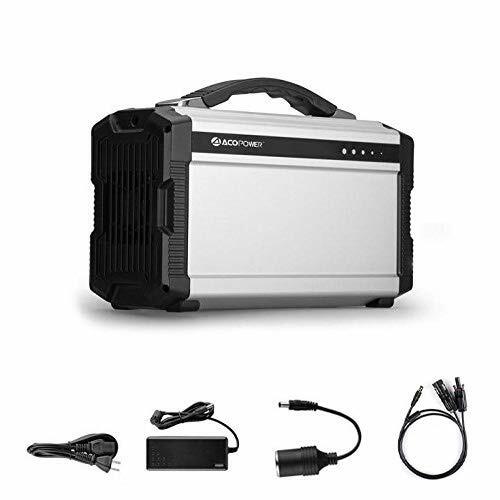 A capacity of 220wh for most of the camping devices. A full charge supports 5.5 hours laptop/tablet, 6 hours 30-60w mini fridge, 8 hours electric fan, 10 hours 20w light, 11 times ipad mini, 32 times smartphone, and 95 hours 2w electric razor ? What You Get: portable power supply, AC wall charger, car charging cable, solar charging cable, and user manual. Technical support and excellent customer service based on California USA. 100% satisfaction guarantee. 2 year warranty.